Friedl Roth with an unidentified man, 1920s Joseph Roth Collection, AR 1764 Austrian writer Josef Roth carried dozens of snapshots of his estranged wife, Friederike (Friedl), among his few possessions until he died in a Paris hospital for the indigent in 1939. In the mid-1920s, Friedl began to manifest symptoms of schizophrenia, and she was eventually institutionalized, plunging Josef into an alcoholic crisis of his own. Josef paid for her stays in a series of private sanatoria until he was no longer able, and Friedl was murdered by the Nazi euthanasia program at Schloss Hartheim in Austria in 1940. The snapshots in Roth’s archival collection show an outwardly happy couple traveling around Europe during the period when Josef was a star correspondent for the Frankfurter Zeitung. 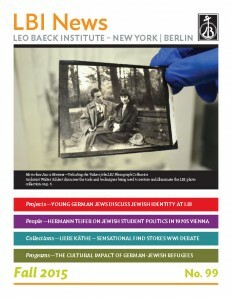 The Leo Baeck Institute’s photo collection contains tens of thousands of photographs of individuals, organizations, synagogues, and important historical events. In recent years, digitization has radically expanded access to this unique collection, but LBI recently launched an initiative to improve access to historic photographs in order to keep pace with evolving standards. Archivist Walter Schlect explains LBI’s work to bring these photographs to light. Most photographs in LBI collections came with donations of family papers to the archives. In the past, they were separated from the archival collections and filed by subject (portraits of men, portraits of woman, synagogues, Jewish schools, etc). 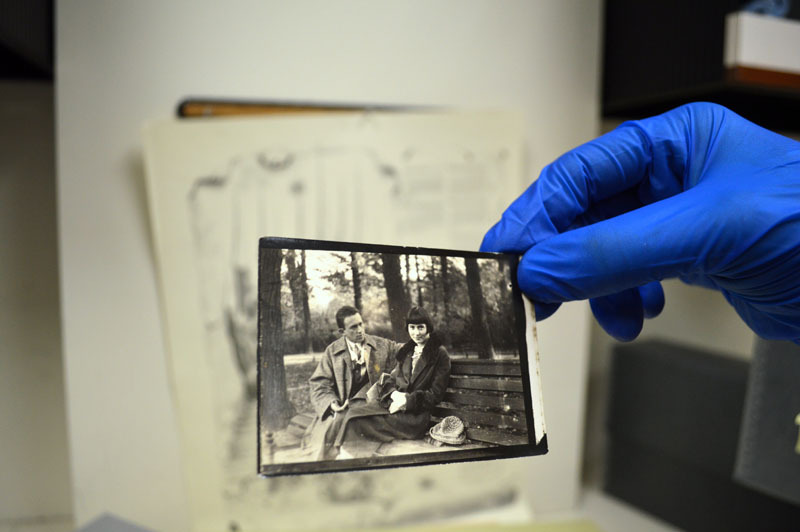 In recent years, most of these images were digitized, which has made it possible for researchers to locate and view photographs— from the iconic image of Albert Einstein riding a bicycle to anonymous snapshots of family vacations in the 1930s. However, not all photographs have been digitized, and many were not digitized at high resolutions for various reasons. Furthermore, the metadata that would answer key questions about the photograph—Who is depicted? Who took the photograph? Was it ever published? Where and when was it taken?— is often inadequate to take advantage of the rich possibilities for browsing and discovery in modern digital catalogs. 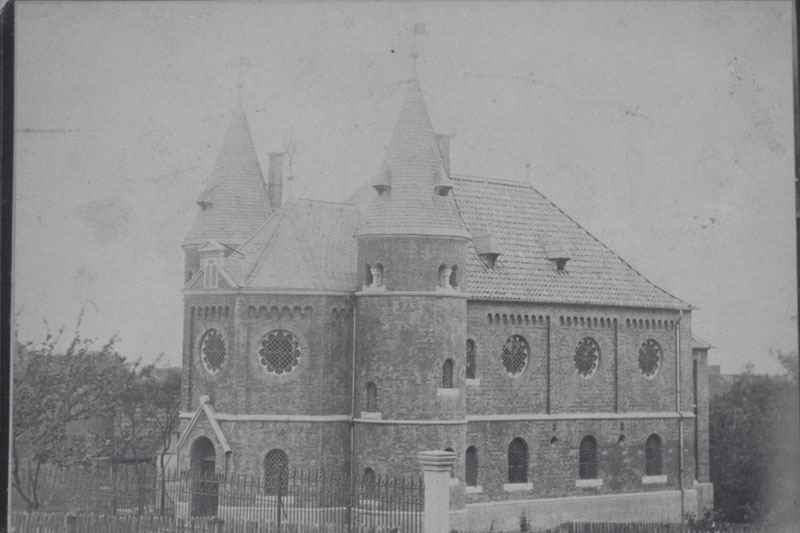 This photograph of a synagogue in Bleicherode, Germany was digitized in grayscale at a low resolution, without significant metadata. For example, the above photograph of a synagogue in Bleicherode (in Thuringia, Germany) could only be accessed by searching for “synagogue” and “bleicherode” in DigiBaeck. A researcher looking for synagogues built by the prominent German-Jewish architect Edwin Oppler would not have found it, because Oppler’s name was not included in the metadata, nor was the name of the photography studio, nor the type of photograph (an albumen print) nor its format (cabinet card). Some of this information was on the photograph, but it was unfortunately cropped out. I rescanned this image in color at a higher resolution. The new image provides a truer sense of the original, and I also added historical and biographical information to the catalog entry that will help users understand the context of this photo. Sharing this information expands the audience for our collection. 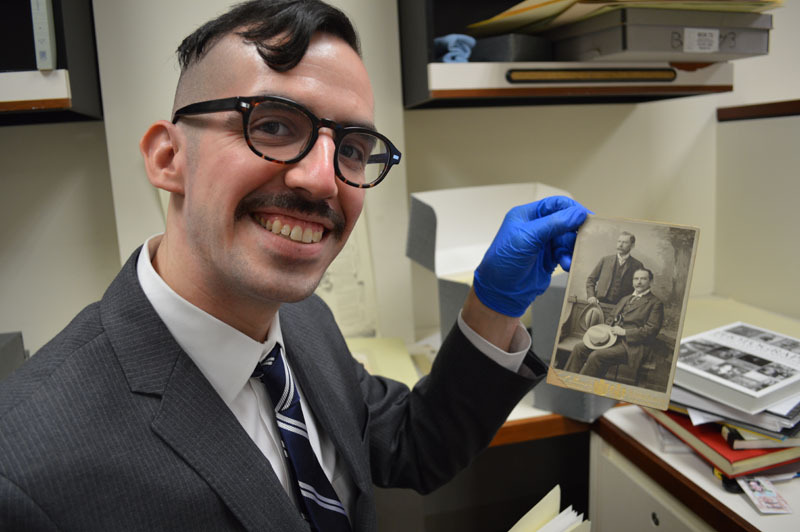 In spring I participated in a four-day workshop on care and identification of photographs sponsored by the New York Metropolitan Library Council and the New York chapter of the Art Library Society of North America. 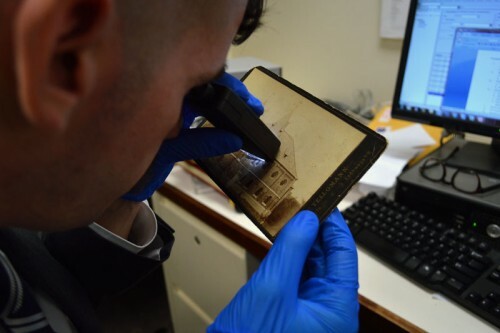 Taught by photo conservator Gawain Weaver, this workshop taught the fundamentals of identifying photographic processes from the daguerreotype to modern-day digital prints. Why is this important? Understanding the materials used to create a photograph helps us to approximately date photographs. 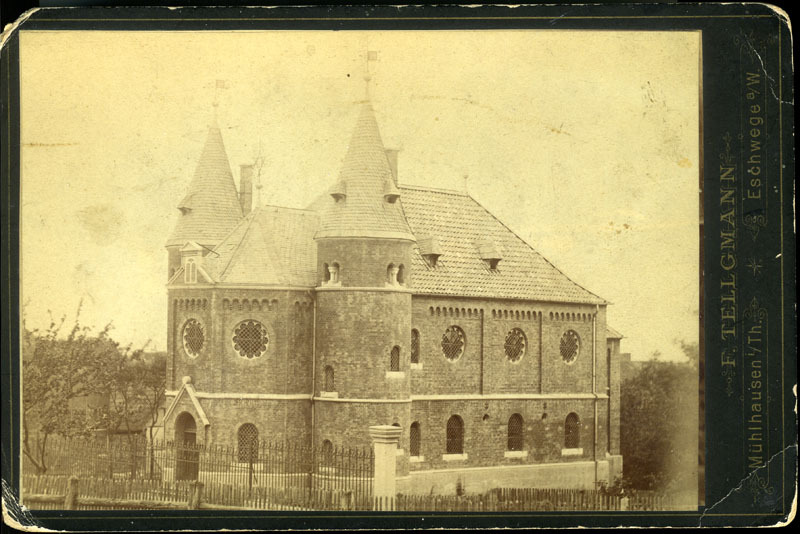 The fact that the Bleicherode synagogue photograph is an albumen print (a photograph that uses an egg white solution to bind the photographic chemicals to the paper) and that it is pasted to a cabinet card, tells us that this was probably made between 1882 (when the synagogue was dedicated) and 1890, when the process had fallen into disuse and was replaced by more efficient methods. Identifying photographic processes requires a combination of observations about the surface and degradation of the photograph (the yellowing appearance is a clue that it is albumen) as well as its appearance under magnification. Going forward, the Leo Baeck Institute plans to re-digitize and enhance metadata for many of our photos, which will be integrated into the forthcoming Edythe Griffinger Art Catalogue, an online repository of visual materials from LBI collections. Magnification can reveal information about the process used to print a photograph, which helps to determine approximate dates. 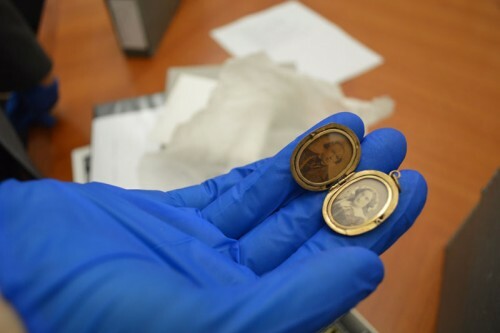 The oldest photographs in LBI collections are typically portraits like the ones in this locket. We are starting with photographs made with early 19th-century processes that are quite rare today, including daguerreotypes, ambrotypes, and tintypes. Early photography shows a fascinating transition from oil and pastel portraits of German Jews of the early 19th century to photographs with German-Jewish sitters in staged settings that were later touched up with paint or pastel. They also depict people, places and events that would otherwise be lost to history. Originally from Yakima, Washington, Walter Schlect studied German at Washington State University and spent two years teaching English in Austria on a Fulbright Fellowship. He is currently writing a thesis on the Czech-Jewish printmaker Emil Orlik for a dual Master’s Degree in Library Science and Art History at Pratt Institute and managing the Edythe Griffinger Art Catalogue project at LBI.